News ► Dream Drop Distance HD Confirmed in X[chi]? Ever since the first remaster in the Kingdom Hearts series was announced, fans have been concerned about the fate of the other titles. Would they receive the HD treatment as well? And in what form? For what system? Among these titles is none other than Kingdom Hearts 3D [Dream Drop Distance], the most recent installment in the series, barring the remixes and browser game. Because the possibility existed that Nintendo had purchased exclusivity rights to KH3D, as they do for many third party titles, the question became whether or not this particular one also fell into the same category. Not only that, but with the game's heavy usage of the 3DS's unique functions, it would be difficult to replicate the experience if a potential remaster were released on the Playstation 3 like its predecessors, or so we had thought. Kingdom Hearts HD 2.5 ReMix was released in Japan in October, and players who were able to obtain a copy quickly discovered that, much like HD 1.5 ReMix, scenes of other titles not included in the remaster were shown during the credits sequence. 1.5 displayed scenes of Kingdom Hearts 2 Final Mix, Birth by Sleep Final Mix and Re:coded, foreshadowing the inevitable HD 2.5 ReMix. 2.5 displayed scenes of Dream Drop Distance and the Kingdom Hearts 3 announcement trailer. Of course the big 3 would be shown off; that much is understandable. But why would 3D make an appearance? Now, the community is certainly no stranger to proposals like this, when a project would "require consideration". While it's something to always take with a grain of salt, it often means there's something deeper, and all it takes to get to it is a little digging, or in this case, dropping. It's an interesting coincidence here that Kingdom Hearts X[chi] is also mentioned in the quote above. X[chi] players are certainly no stranger to hidden messages and secrets, such as that of the Tome of Prophecy which plays a big part in the upcoming Kingdom Hearts 3. However, that is not what is worth noting at this moment. Let's go back to January 2014. This was a very exciting time for Chi players, as it was during this month when Birth by Sleep cards made their debut in the game. Kingdom Hearts X[chi] adopts a card-based system where 3 cards in a deck of 9 are randomly used on a turn-to-turn basis in battle. Each card features a unique character render or artwork.] This was the first time any cards not from Kingdom Hearts 1 or 2 appeared, and with Birth by Sleep being such a fan-favorite, the players were beyond esctatic and couldn't wait to see Terra, Aqua and Ven again. However, you could tell right away that something about their new renders was.. different. They were improved and more detailed; crisp and clean with sharp colors that weren't present in their original appearances. It's interesting to note that this was the very first time we laid our eyes on their improved models for Kingdom Hearts HD 2.5 ReMix outside of the announcement trailer we received at D23 Expo Japan. Who would have ever thought they would show off something like that in this innocent browser social game? And who would have thought they would do it again? For those of you keeping up with X[chi], the game has recently been releasing a slew of cards of characters specific to Kingdom Hearts 3D, most recently from The Grid and Country of the Musketeers. 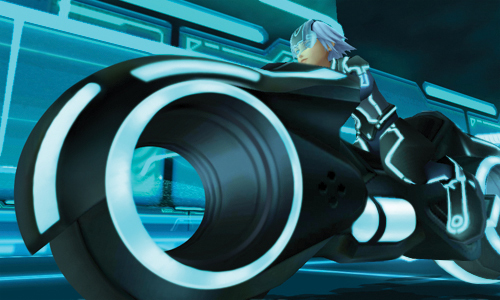 Among these is of course, Tron Legacy Riku, but once again, something looks rather peculiar. Upon looking at the image on the right, you immediately notice that something's been changed. While it may be difficult to see, Riku's mask is a huge giveaway that his model as received some upgrades. For what reason, you must have figured it out by now. The first cards featuring Kingdom Hearts 3D were added to X[chi] in August 2014. Could it be possible that work on a remaster had begun around this time? Do you think this is all just some weird coincidence and can't possibly mean anything? Is it possible that we might see a remaster at the upcoming Jump Festa? Let us know! If he's teasing it. That's a big yes I presume. Sony is having a PlayStation event by the first week of December or maybe we will find out by Jump Fiesta. It was pretty obvious that we were going to get 3DHD in some form at some point. If the 3D cards hint towards this, it wouldn't necessarily surprise me. Very good eyes Sign! I'll admit, after reading this I tried to see if there were any other alterations to the characters in the cards and all I could kind of see was Neku's necklace and Sora's The Grid helmet having 5 weird spots of light but I don't think those confirm anything. If this isn't for a HD Remaster, it's really suspicious why they would modify his model. Oh, it was. But the article is meant to acknowledge the existence of the proof itself. It's odd though, the newer render of Riku looks lower quality..like his fingers are bunched together and has the lovely fish face. The old render of Riku is his cutscene high-poly model, whereas the newer render is his lower-poly gameplay model (where you obviously will not see his fish face). I'm thinking that, if a 3DHD is announced soon, it'll either be at the Playstation event in early December or Jump Festa. Given how KH stuff is almost always announced for Japan first though, I'm thinking Jump Festa is the more likely of the two if it happens. Nomura's track record generally leaned towards a Jump Festa preference, so there's a pretty good chance. I have no doubt that we will get the game in HD but the question is what other "stuff" will come with the game or if it will be only digital, I can't see them releasing the game as a standalone. Well, I certainly don't think it's out of the question, and I suppose JF is appropriate. I can't see them releasing the game as a standalone. A 3DHD released for a reduced price, like $20? Totally possible. Chi on Vita has been what I've been hoping for all along. That's REALLY cheap for a game worth more. I'm all for cheap games, but $20 is insultingly low for the amount of work that'd go into remastering 3D. Well, 3D was originally $40, and HD rereleases are sold for cheaper than normal. Other games, like Okami HD, sold for around that price point. And since it's significantly less content than 1.5 and 2.5, which are $40 at release, it seems like a fair price to me. This is, of course, assuming 3DHD would be just a standalone release of 3D. Final Fantasy Type-0 is going to be released at almost full price though, even if the improvements are only some difficulty adjustments and better graphics (I don't know if it's only the textures and effects or more) and no new content. The same would be true for a DDD HD port, although there would probably at least a little bit of additional content. Still great you've spotted this Sign, the textures of the Riku model are indeed improved so I guess the port/remake is on its way afterall. :biggrin: I still wonder why they copped out at delivering a Lea + his Keyblade card. Also every time Okami is mentioned I have to tell everyone to buy it, because it's a really great game, the HD port even more. That's partially because it's never been released here at all, though (unless that is also the Japanese price?). Remasters cost less because they're trying to get you to buy a game you may have already bought, that's not a major concern for Square and Type-0, I imagine. That's partially because it's never been released here at all, though (unless that is also the Japanese price?). In Japan, Type-0 sells for 5880 JPY which is roughly $50 USD, $41 Euro, and $58 AUD.